In November 2010, a young Tunisian rapper who called himself El General posted a song on his Facebook page and YouTube. He had no alternative. The government of President Zine al-Abidine Ben Ali had virtually banned hip-hop. Its musicians were not on government-approved playlists for state-controlled television or radio. They were rarely able to get permits to perform in public. And most were barred from recording CDs. El General—whose real name is Hamada Ben Amor—had no resources of his own. At age 21, he faced the problems of many young Tunisians. He was without reliable work and still living at home with his parents. For Tunisia’s rappers, the only regular gigs were on the Internet. So he recorded the song underground. Songs by Tunisia’s El General, above, were sung at street protests. “I had two friends,” he later explained. “One filmed my songs on a small video camera, and the other edited the videos and put them up on YouTube.” It raged against the problems of poverty, unemployment, hunger and injustice—and boldly blamed them all on Mr. Ben Ali. The four-minute video was haunting and raw. It showed the young rapper sauntering through a dark, sewage-strewn alley on his way to a makeshift studio with graffiti spray-painted on the wall. He beat out the song in front of an old-fashioned mike, with no one else in sight, and then ambled back down the alley into the night. His face was never in the light, his identity remained unclear. Going public was too dangerous. El General’s song was an instant sensation. Its outrage resonated, especially among the young. It broke through the climate of fear in a country where no politician had dared to criticize a president in power for almost a quarter-century. His incendiary rap registered hundreds of thousands of views on YouTube and across other social networks. The amateur video was even picked up by Al Jazeera, the 24-hour Arabic news channel. A few weeks after the song began circulating, a government inspector demanded a bribe from Mohamed Bouazizi, a street vendor in Sidi Bouzid. She confiscated his produce and his scales. When he could find no recourse, he set himself on fire over the same problems that echoed through the plaintive rap lyrics. 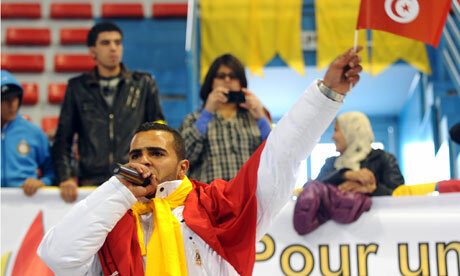 As protests over Mr. Bouazizi’s plight spread across the country, El General’s rap became the rallying cry. Verses were sung by tens of thousands of Tunisians in street demonstrations demanding the president’s ouster. For El General, the words proved personally prophetic. As the Jasmine Revolution gained momentum, he wrote another song entitled “Tunisia Our Country.” Its blunt condemnation bordered on treason. At 5 a.m. on a cold winter day, government security forces showed up at his door in Sfax, a former commercial center on the Mediterranean coast. The young rapper was taken to a prison in Tunis. He was put in solitary confinement and repeatedly interrogated about possible political connections, according to news reports at the time. But in the breathtaking speed of the first Arab revolt, the revolutionary anthem had already made him famous. Demonstrators began demanding his release as well as the president’s resignation. “They asked me, ‘Please stop singing about the president and his family, and then we’ll release you,’ ” he later recounted to Time magazine. Two weeks after the Tunisian president abruptly fled, El General performed in public for the first time. Wearing the Tunisian flag draped around his shoulders, he belted out his anthem for a crowd of thousands. His appearance brought the Jasmine Revolution full circle. Mannoubia Bouazizi, the mother of the young street vendor whose self-immolation launched the uprising, had traveled to Tunis to share the stage. The two young men had transformed political activism in Tunisia—and in turn the entire Arab world. El General’s song became the anthem of revolutions across the region. It was sung in street demonstrations from mighty Egypt to tiny Bahrain. Through Facebook, he had many requests to join the protesters at Cairo’s Liberation Square. He had no passport, so he opted to work instead on a rap ode to Arab revolution. 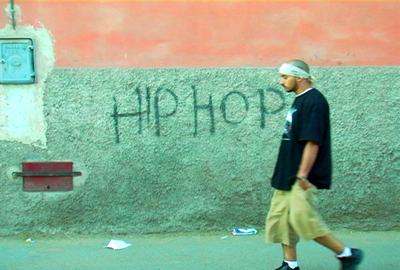 Across the Islamic world, hip-hop has now created an alternative subculture among the young. Rap is its voice in a 4/4 beat. Muslim rap is replete with beeps, bops and beatboxes, although without the materialism, misogyny, vulgarity and “gangsta” violence of much Western hip-hop. The messages of Muslim rappers are just as bold and blunt, however, and the names they take are defiant. DAM and Rapperz were early Palestinian groups. Kla$h is a Saudi. Afrock and Da Sole are Tunisian rappers. Desert Heat came from the United Arab Emirates. Disso R Die and ThuGz Team are Kuwaitis. Rappers DJ Outlaw and Chillin came from little Bahrain. Hich Kas—which means “nobody” in Farsi—was among the first of many Iranian rappers. Boyz Got No Brain are Indonesian rappers. MC Kash is an Indian rapper in Kashmir. Embracing rap does not mean that young Muslims are mimicking the West or secular ways. Many rappers are, in fact, surprisingly observant. Islamic hip-hop is now a genre, like Christian hip-hop and Gospel rock. Morocco’s sultry Soultana—whose sneakers sport pink shoelaces—often takes a break if the muezzin issues the call to prayer while she is performing. Because one criminal did it wrong in the name of Islam. Our Islam is peace, love, respect. During a performance in Rabat, three men told Soultana that female singers were haram, or forbidden, to perform in front of men. She simply countered, “I read the Koran.” Then she went on singing.